Shown on the front side of this tooth is the Whaler Catalpa with one of her whaleboats in the process of being destroyed by a Sperm Whale. The men in the second boat have just cut from their own whale and are speeding to help their shipmates. At the top are the American and Irish flags, as well as an American eagle. On the reverse side is a view of New Bedford harbor showing two distinctive rooflines, the church tower, lighthouse and ropewalk buildings. The harbor is bustling. Around the entire tooth at the bottom is a band of Irish shamrocks. The tooth was sold with a handcrafted Sterling Silver base (with cast Sterling Silver Sperm Whale) from which it can be removed and replaced for closer viewing. This is a superbly curved, left-handed tooth which is 6 1/8 inches around its curve, and 1 3/4 inches across its base. The 200 ton Whaler Catalpa was the Bark that was sent to secretly help six bold Irish revolutionaries excape from their Australian prison in 1875-1876. She made two whaling voyages from New Bedford from 1852-1860. She was then sold for use as a merchant ship in 1862. Four years later she resumed whaling, under the ownership of N. T. Gifford. After one voyage she was sold in 1873 to F. W. Homan of Gloucester, who put her in the lumber trade to the West Indies. The following year he sold her to John T. Richardson of New Bedford. Though a whaling agent in his own right, Richardson purchased the bark on behalf of the Clan na Gael, an Irish-American organization whose leadership had a bold plan to rescue six Fenian convicts in Fremantle, Western Australia. Thomas Darragh, Martin Hogan, Michael Harrington, Thomas Hassett, Robert Cranston, and James Wilson. British Army veterans, all had been given life sentences in 1866 for their involvement in a planned uprising by the United Irish Brotherhood. Fitted out for whaling in the Atlantic, Catalpa sailed from New Bedford on August 29, 1874, with a crew of 22. The only man who knew of her true mission was Captain George S. Anthony, a veteran whaler and Richardson's son-in-law. Anthony confided his secret mission to his first mate, Samuel Smith, before making for Australia. After 11 months at sea, she landed at Bunbury, about 85 miles from Fremantle, on March 28, 1876. On April 17, the six prisoners walked away from their various assignments, and were spirited down to Rockingham Beach with four men who helped plan the escape. There the ten embarked in a whaleboat. After 28 hours rowing after Catalpa while evading a police cutter and the mail steamer Georgette, they were brought aboard the whaleship, which promptly hoisted the American flag and stood out to sea. The next morning, Georgette resumed the chase. At 0800 she fired a warning shot across Catalpa's bow and ordered her to stop. "You have six escaped prisoners aboard. I give you fifteen minutes to consider, and if you don't heave to, I'll blow the masts out of you." Captain Anthony replied, "That's the American flag. I am on the high seas. My flag protects me. If you fire on this ship you fire on the American flag." After a tense hour and a half, Georgette put about for Fremantle and Catalpa was on her way. Anthony steered Catalpa for New York, where they landed on August 19, 1876. News of their arrival spread quickly, and when Catalpa put into New Bedford five days later, she was greeted with a 71-gun salute representing every state in the Union and every county in Ireland. The six ex-convicts settled in the United States. This is, of course, a legal tooth, registered with the U.S. Department of Commerce as #21-227.0004. It weighs 189 grams. 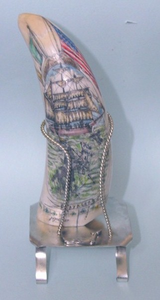 This is a wonderfully intricate and interesting classic piece that will be much appreciated by any scrimshaw collector. A unique piece - Of course, only one available.